“Nagios OS autoconfigurator” (N_O_conf) is a cloud monitoring system that automatically adapts its monitoring behavior to the current user-initiated VM infrastructure. 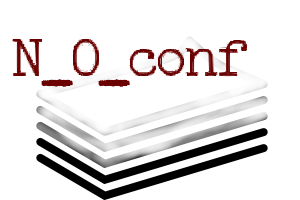 N_O_conf works by installing a cloud environment change listener daemon which is repeatedly polling the OpenStack API for changes in the VM infrastructure. As soon as a VM destruction is detected, it initiates a reconfiguration of the Nagios monitoring server. Nagios OS autoconfigurator can be installed on top of every OpenStack-based cloud environment without interfering with the cloud providers infrastructure, because it can be installed inside virtual machines so cloud consumers can use it as their own monitoring system. N_O_conf monitoring system monitors all VMs that are owned by the user that installed it. There are many tools available which can be used to monitor operation of the Opentack infrastructure, but as OpenStack user you might not be interested in monitoring OpenStack itself. Your primary interest should be the operation of the VMs that are hosted on OpenStack. Nagios OpenStack Installer is a tool for exactly that purpose: it uses a Nagios VM inside the OpenStack environment and configures it to monitor all VMs that you own. Nagios OpenStack Installer configures your OpenStack monitoring environment remotely from your desktop PC or labtop. In order to use Nagios OpenStack Installer you need to fulfil the following prerequisites. You must have an SSH Key for securely accessing the Nagios VM and the VMs you own and you must know the SSH credentials to access the VMs. You must know your OpenStack user account (name and id), your OpenStack password, the OpenStack Keystone authentication URL and the OpenStack tenant (“project”) (name and id) you work with. You must be able to create a VM that serves as Nagios VM and you must own a publicly available IP (“floating IP”) to make the Nagios dashboard accessible to the outside world. pip: The package manager to install Python packages from the PyPI repository (Windows users should refer to the pip developer’s “get pip” manual to install pip, Cygwin users are recommended to follow these guidelines in atbrox blog). fabric: This package is used to access OpenStack VMs via SSH and remotely execute tasks on the VMs. python-keystoneclient: To access the OpenStack Keystone API and authenticate to your OpenStack environment. python-novaclient: To manage VMs which are hosted on OpenStack. cuisine: This is a configuration management tool and lightweight alternative to configuration managers like Puppet or Chef. cuisine is required to manage the packages and configuration files on the Nagios VM and the monitored VMs. pickle: pickle is a object serialization tool that can store objects and their current state in a file dump. Object serilaization is used to get the list of VMs which should be monitored. We recommend to use pip for installation of the required packages, since pip automatically installs package dependencies. You must have Git downloaded and installed. After having installed the prerequisites on your local PC or labtop, you can use Nagios OpenStack Installer by performing the following steps. Edit the credentials in install_autoconfig.py, remote.py, remote_server_config.py and vm_list_extractor.py to match your OpenStack and SSH credentials. Run remote_server_config.py from Python console. This installs and configures Nagios server on your Nagios VM. After installation you should be able to access the Nagios Dashboard by pointing your webbrowser to “http://<your_nagios_public_ip>/nagios” and providing your Nagios login credentials. Run vm_list_extractor.py from Python console. This will extract the list of VMs on OpenStack that should be monitored and save the list as pickle file dump on your computer. Run install_autoconfig.py from Python console. This will upload the Python scripts required to automatically update the Nagios configuration in case of changes in the OpenStack VM environment (nagios_config_updater.py, config_transporter.py, config_generator.py, vm_list_extractor.py). Additionally it will run these Python scripts on the Nagios VM to let Nagios capture the VMs which should be monitored, install and run the required Nagios and NRPE plugins on these VMs and reconfigure and restart Nagios server to monitor these VMs remotely. Now the Nagios environment is installed and you should be able to monitor your VMs. Nagios OpenStack Installer is available on ICCLab’s Github repository. Feel free to try it out and give feedback about future improvements. 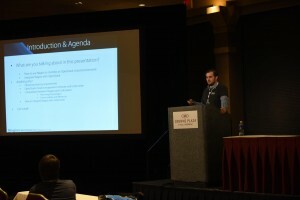 ICCLab Cloud HA initiative Leader Konstantin Benz explains the OpenStack Nagios integration to the interested audience. The icclab participated on the Nagios World Conference 2014 which took place Oct 13th-16th, 2014 in St. Paul, MN, USA. Icclab’s Cloud High Availability-initiative leader Konstantin Benz presented an approach on how to use Nagios Core to monitor utilization of OpenStack resources. The key point he mentioned was that Nagios has to be reconfigured elastically in order to monitor virtual machines in an OpenStack environment. Depending on implementation requirements, it can be useful to exploit configuration management tools like Puppet or Chef to automatically reconfigure the Nagios server as soon as new VMs are commissioned or decommissioned by cloud users. Another approach could be to exploit OpenStack’s Ceilometer component though an integration of Nagios with Ceilometer could lead to data duplication which can be problematic for some systems, said Benz. Besides the Nagios-Ceilometer plugin Benz was able to show how elastic Nagios reconfiguration could work with Python fabric and the Cuisine library. This approach seems to be a lightweight solution to monitor VM utilization in OpenStack with Nagios. Benz also discussed a similar approach which has been chosen in the XIFI-project. The eXtensible Infrastructures for Future Internet cloud project uses Nagios as main monitoring tool to monitor OpenStack instances and resources provided by OpenStack. 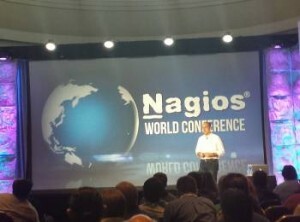 Nagios Founder Ethan Galstad presents Nagios Log Server to the audience. A highlight of the Nagios conference was a demo presentation of Nagios Log Server which was announced by Nagios Founder Ethan Galstad. Nagios Log Server allows for scalable and fast querying of log files – fully replacing “ELK”-Stack (ElasticSearch, LogStash, Kibana) solutions. Nagios Log Server is available under a perpetual licence that costs $995. Compared to commercial solutions this is a very modest price. In contrast to ELK-Stack solutions, Nagios Log Server offers user authentication to protect sensitive data in logfiles to be viewable by unauthorized website visitors. Another advantage are customizable visual dashboards that show log file findings. Visualization makes the task of reporting incidents to higher management a lot easier and allows for better monitoring. The famous Nagios open source monitoring system has become a de facto standard in recent years. Unlike commercial monitoring solutions Nagios does not come as a one-size-fits-all monitoring system with thousands of monitoring agents and monitoring functions. Nagios is rather a small, lightweight monitoring system reduced to the bare essential of monitoring: an event management and notification engine. Nagios is very lightweight and flexible, but it must be extended in order to become a solution which is valuable for your organization. Plugins are a very important part in setting up a Nagios environment. Though Nagios is extremely customizable, there are no plugins that capture OpenStack specific metrics like number of floating IPs or network packets entering a virtual machine (even if there are some Nagios plugins to check that OpenStack services are up and running). Ceilometer is the OpenStack component that captures these metrics. OpenStack measures typical performance indices like CPU utilization, Memory allocation, disk space used etc. for all VM instances within OpenStack. When an OpenStack environment has to be metered and monitored, Ceilometer is the right tool to do the job. Though Ceilometer is a quite powerful and flexible metering tool for OpenStack, it lacks capabilities to visualize the collected data. It can easily be seen that Nagios and Ceilometer are complementary products which can be used in an integrated solution. There are no Nagios plugins to integrate the Ceilometer API (though Enovance has developed plugins to check that OpenStack components alive) with the Nagios monitoring environment and therefore allow Nagios to monitor not only the OpenStack components, but also all the hosted VMs and other services. The ICCLab has developed a Nagios plugin which can be used to capture metrics through the Ceilometer API. The plugin is available download on Github. The Ceilometer call plugin can be used to capture a Ceilometer metric and define thresholds for employing the nagios alerting system. In order to use the plugin simply copy it into your Nagios plugins folder (e. g. /usr/lib/nagios/plugins/) and define a Nagios command in your commands.cfg file (in /etc/nagios/objects/commands.cfg). Don’t forget to make your Nagios plugin executable to the Nagios API (chmod u+x). Then you have to define a service that uses this command. Now Nagios can employ Ceilometer API to monitor VMs inside OpenStack.